"I think China, from a counterintelligence perspective represents the broadest, most challenging, most significant threat we face as a country," Wray said during a security conference in Colorado. The FBI director said the Chinese utilize a "whole of state" spying effort. "It is economic espionage, as well as traditional espionage," he said. "It is non-traditional collectors as well as traditional intelligence operatives. It is human sources as well as cyber means." The extent of the problem is highlighted by the FBI currently conducting economic espionage investigations that trace back to China in all 50 states. "It covers everything from corn seeds in Iowa to wind turbines in Massachusetts and everything in between," Wray said. "The volume of it, the pervasiveness of it, the significance of it is something that this country cannot underestimate." The stepped up FBI focus on China contrasts sharply with past policy. For many years, Chinese intelligence gathering was largely ignored by several administrations. Two recent espionage cases involved former U.S. intelligence officials who spied for China. China uses some of the 350,000 Chinese students studying in the United States for spying. Former Chinese government insider Guo Wengui disclosed that China utilizes a network of up to 25,000 intelligence collectors in the United States. Wray also disclosed new details of stepped up FBI efforts to counter foreign influence operations like the Russian government cyber-backed campaign to influence the 2016 election. The FBI has created a foreign influence task force that is utilizing agents from counterintelligence, criminal, cyber, and counterterrorism sections to halt foreign influence operations. "It's not just a counterintelligence problem," Wray said. "Yes it's a tool of foreign intelligence efforts but it's also got cyber means. But on top of that there's all sorts of criminal laws that can get violated in the process." The FBI is using criminal investigations as "disruption techniques" against foreign influence operations. For example, foreign states are fueling racial unrest in the United States by supporting white nationalist groups, he said. "Foreign influence is being used in many ways to capitalize on that, to spin up domestic extremist movements to create terrorist attacks here inside," Wray said. "So again there's a multidimensional effort." One recent example was the arrest last week of Russian national Maria Butina, who was charged with conspiracy to act as an agent of Russia in the United States. An FBI criminal complaint in the case states that Butina worked at the direction of a high-level Russian government official to infiltrate American organizations. Butina was close to the National Rifle Association. On the Chinese intelligence threat, Wray said Russia also poses a significant intelligence threat. "Obviously the Russia threat is a significant one that I think we need to deal with very aggressively indeed," he said. But what he bluntly termed "the China threat" involves a strategic effort by China to supplant the United States around the world. "China is trying to position itself as the sole dominant superpower, sole dominant economic power," Wray said. "They're trying to replace the United States in that role." To support that goal, China's communist government is engaged in aggressive intelligence gathering efforts. "So theirs is a long term game that is focused on just about every industry, every quarter of society," Wray said. "It involves everything from agriculture, high tech." The FBI director described Chinese spying as a "more pervasive, broader approach" that in many ways posed a greater long-term threat to the country than intelligence operations by Russia and other states. Asked whether the American government and people have not taken the Chinese intelligence threat seriously enough, Wray said that is changing. While the country is divided politically on many issues, there is a growing awareness of the China threat. "I think people are starting to come together," Wray said of understanding Chinese operations. "I see it in the interagency. I see up on the Hill when I'm talking to the intelligence committees across the spectrum. People are starting to wake up and sort of rub the cobwebs, the sleep out of their eyes. And my hope is that we're in a moment where as a country we can pivot and really take this much more seriously." The FBI is working closely with private companies in thwarting Chinese economic spying. Many companies have come forth to the FBI to disclose information about Chinese collection efforts. Asked about the Chinese threat on American universities, Wray said Beijing is targeting post-graduate research and activities targeting U.S. science, technology, engineering, and mathematics, or STEM, academics. Wray urged universities to contact FBI offices if there are indications of Chinese spying. Over the past several years, universities have begun to engage with the FBI on the problem, despite some reservations about FBI agents providing greater awareness of intelligence threats targeting academic research. "I've been very encouraged by a lot of universities around the country in the way people have responded and pushed back on certain research and development exchanges and so forth," Wray said. "And it's a challenge. We have an open research environment, which is one of the strengths of the country. But people need to do it with their eyes open and really think carefully about what they're getting into." On Thursday, Director of National Intelligence Dan Coats said he agrees with Wray that China is America's most significant threat. Asked what is being done to counter the threat, Coats said, "we're becoming ever more aware of what the Chinese are trying to do" and China is being called out on that subject. Efforts to counter China is "an issue of significant discussion" within the U.S. government, Coats said at the same conference. Coats said the China is seeking to be a global power and is spreading influence through its economic development program called One Belt, One Road, and through expansion in the South China Sea. The challenge for the U.S. government is to clarify whether China is "a true adversary or a strategic competitor," he said. The first step is to stop China from stealing U.S. secrets. "Don't send your kids here and don't put your people in our labs," he said. "They've got a long-term strategy and we've got to adjust to that," Coats said. Asked his view of China as an enemy or competitor, Coats said "it's a blend of both." China does some adversarial activities but those operations are not the type of things that Russian intelligence is doing, he added. On other topics, Director Wray said the threat posed by Russian election meddling continues. "It is a threat that needs to be taken extremely seriously," he said. He declined to comment on the indictment earlier this month by Special Counsel Robert Mueller of 12 Russian GRU military intelligence officers for their role in the 2016 election interference. He defended the FBI from critics who said the law enforcement agency has been politicized. Former FBI director James Comey and former deputy director Andrew McCabe were fired, and several other FBI officials are under investigation. 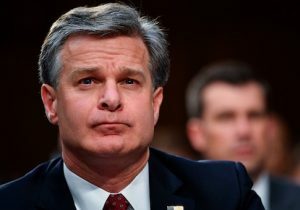 Wray said the scandal involving senior FBI counterintelligence official Peter Strzok should not diminish the successful work of the FBI, which has some 37,000 agents, analysts, and staff. Strzok had an extramarital affair with an FBI lawyer, Lisa Page, and exchanged text messages with her that threatened to use FBI power to prevent Trump from being elected.